“Post-Traumatic Stress Disorder” is a diagnosis created by the American Psychological Association in response to the problems seen in waves upon waves of Vietnam veterans (APA, 1980; van der Kolk, 2004). We are now witnessing history repeat itself as the next generation returns home from war with similar mental health issues. According to a 2008 RAND study, 18.5% of combat troops who recently returned from Iraq or Afghanistan met criteria for either Post Traumatic Stress Disorder (PTSD) or depression. When left untreated, these problems can lead to substance abuse, job loss, domestic violence, divorce, financial difficulties, and even suicide (National Center for PTSD, 2006). Hyperarousal, which can be expressed as sleep problems, concentration difficulties, irritability or outbursts of anger, hypervigilance, and/or exaggerated startle reflex. “People who suffer from PTSD are plagued with frightening body symptoms which are characteristic of hyper-arousal: accelerated heart beat, cold sweating, rapid breathing, heart palpitations, hypervigilance, and hyper startle response (jumpiness). These symptoms lead to sleep disturbances, loss of appetite, sexual dysfunction and difficulties in concentrating, which are further hallmarks of PTSD. Hyper-arousal both instigates flashbacks and is also increased by them, and hyper-arousal is the underlying cause of the symptom of avoidance, as traumatic reminders increase ANS arousal. Through understanding hyper-arousal, the phenomenon of PTSD becomes comprehendible.” (Rothschild, 1997, ¶6). “These patients cannot stand being slapped on the back abruptly; they cannot tolerate a misstep or a stumble. From a physiologic point of view there exists a lowering of the threshold of stimulation; and, from a psychological point of view a state of readiness for fright reactions” (1941, p.95, as cited in van der Kolk, 2004, p.320). In the U.S., sensory symptoms have been reported by combat veterans of all wars since the Civil War (and across cultures, they have been reported since ancient times). For example, “dizziness” has been listed as a common combat-related symptom for the Civil War, World War 1, Korean War, World War II, Vietnam, Gulf War, Afghanistan and Iraq (Dunnigan & Nofi, 1999; Institute of Medicine, 2008). This makes sense, as there are strong reciprocal pathways between the vestibular system, which is responsible for our sense of head position in space, and the autonomic nervous system, which is responsible for the stress response. Some sensory symptoms appear to vary depending upon the nature of the threats encountered in the particular war situation. For example, Hunt and colleagues (2006) observed that combat soldiers serving in Iraq and Afghanistan, where improvised explosive devices (IEDs) are commonly encountered, are often triggered by, and demonstrate hypervigilance toward, external cues such as cars that may possibly be carrying explosives. By contrast, those who served in the Gulf War, where toxic chemical exposure was common, are more often triggered by, and demonstrate hypervigilance toward, internal or somatosensory cues, such as unusual feelings or sensations in the body, limbs, head, or related to breathing (Hunt et al, 2006). However, Dr. Bessel van der Kolk points out that heightened physiological arousal does not just occur in response to traumatic reminders, that is, triggers, but also occurs in response to intense but neutral stimuli (van der Kolk, 2000). The Adolescent/Adult Sensory Profile was also one of three measurement tools used for the Iraq Yoga Study, which found a strong positive correlation between the following: sensory sensitivity, sensory avoidance, low registration, state anxiety and trait anxiety, as well as a strong negative correlation between sensory seeking behaviors and all of the above (except for low registration, which was insignificant), again all at the .001 level of significance. (Stoller, et al, 2012). The Kirkuk, Iraq yoga study is the only published investigation to date that has closely examined sensory symptoms in deployed active-duty military personnel. “Sensory processing” refers to how the nerves communicate together to process all of the incoming information from our senses in order to plan our movements, generate ideas, and produce other thoughts and behaviors. Single neurons cannot “think”, but when groups of neurons all interact together in a focused way for a particular purpose, the result is organized action or thought. As described earlier, PTSD is a label we use to identify a disruption in this process due to trauma. You may have heard the terms “sensory processing” and “sensory integration” in reference to children who suffer from developmentally based disorders. Beginning in the 1960s, Dr. A. Jean Ayres conducted large studies of children who presented with a variety of sensory processing disorders. These studies led to the development of a very large body of knowledge organized into a “sensory integration theory”, as well as a somatic-based treatment model frequently used in the field of occupational therapy that is referred to as “sensory integration treatment” (Ayres, 1972; Bundy, Lane, & Murray, 2002). In the field of occupational therapy, many of the treatment principles developed from the sensory integration theoretical model are now being effectively applied to adults who exhibit problems with sensory processing, though the actual techniques are adapted specifically to this age group (May-Benson, 2009; Champagne, 2006; Pfeiffer & Kinnealey, 2003). How Might Yoga Affect Sensory Processing (and Help Heal Trauma)? As psychiatrist and trauma expert Bessel van der Kolk (2008) explained, trauma is stored in every cell of the body, and must be safely released by the body. We cannot simply approach trauma through talk therapy. With trauma victims, one of the biggest difficulties is the mind is often dissociated from the body. Yoga is a practice that directly addresses the mind-body connection, and one way it does this is through the breath. The autonomic nervous system (ANS) is the branch of the nervous system responsible for the “fight-flight” reaction, and respiration is the only function of the ANS humans have control over. All other functions of the ANS are involuntary, such as heart rate, blood pressure, sweating, eye dilation, digestion, and so on. The pranayama practices (i.e. specific breathing exercises) that are often conducted in yoga classes can affect the ANS in either direction, toward increased arousal or toward relaxation, depending on the technique. We train our teachers how to perform pranayama techniques that are known to help re-set the ANS toward a calm and relaxed state. The yoga asanas (poses) also help the veterans get out of their heads and back into their bodies. The stretching, strengthening, and changes in bodily position and alignment produce bodily sensations, increasing body awareness in the present moment, and help the mind move out of its “rut” of “stuck thoughts”. Sometimes PTSD can feel like a car stuck in the mud; the more one tries to move out of it (that is, not think about the trauma), the more entrenched in the mud it becomes. 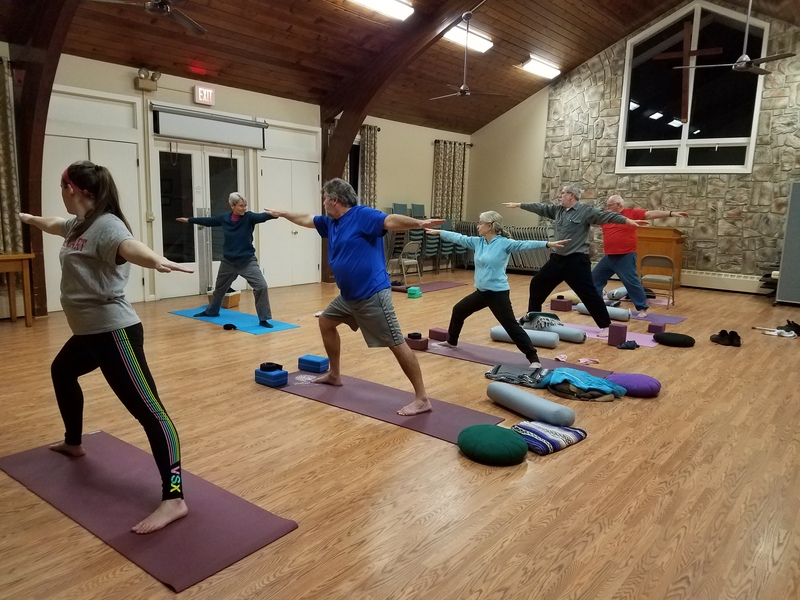 Yoga helps individuals connect the mind with the body, drawing the person back into an embodied state of being. Sometimes it begins with just one moment when the mind becomes clear and present. Over time, these moments become more frequent and last longer*, re-activating neuronal circuits to brain centers responsible for our sense of self and sense of presence. With regular practice, the mind gradually returns home from war (or from some other unbearable experience). *The person may not even be aware of this at the beginning, because when the trauma returns to mind, it may feel like it never left. One can’t ask oneself, “Am I still thinking of the purple elephant?” without thinking of the purple elephant! It is important to accept the intrusive thoughts without fighting them and without judgment (which only serves to reinforce them). Trust the process, knowing others before you have successfully been completely cured of this debilitating symptom. We can enhance the natural healing qualities of yoga by also taking into account its sensory effects on the brain, and by tweaking our yoga classes to maximize their potential to reduce ANS arousal, reduce sensory hypersensitivity, and to promote sensory integration. Borrowing from sensory-based occupational therapy practices, Sensory-Enhanced Yoga® is especially designed to provide enhanced proprioceptive (muscle) input, deep touch pressure, some slow rhythmical movement, carefully selected pranayama (breathing) techniques that promote calming, and a series of asanas that are chosen to balance the nervous system toward a more relaxed and steady state. Special care is taken to help students coordinate movements with the breath. In addition, careful stretching techniques are employed to help release trauma-based muscular tension. The above techniques must be provided within a “safe container”, which means attending to the environmental qualities of the setting as well as the interpersonal relationship between therapist and client. Through this process, the mind releases negative thinking patterns and becomes more open to new perspectives. New beliefs and attitudes more easily take hold when we first prepare the body to receive and accept them. To capitalize on this opportunity, we incorporate posture-inspired positive suggestions, guided body-based meditations, and, occasionally, self-generated affirmations and inspirational readings into the practice, thus addressing the nervous system from both the “bottom-up” (using the power of the body to influence the mind) and “top-down” (using the power of the mind to influence the body). Infusing “top-down” elements into the practice further affirms the underlying strength of the individual and nurtures more positive thoughts, attitudes, and experiences to promote health and wellbeing. Our teachers are also taught to be observant of their students’ reactions and adhere to a range of precautions in working with traumatized individuals. If you wish to learn more about Sensory-Enhanced Yoga® please consider registering for an upcoming two-day Sensory Enhanced Yoga® for Self-Regulation & Trauma Healing workshop for occupational therapists, nurses, and licensed mental health clinicians or for certified yoga therapists and yoga instructors. Depending upon your professional license, please click on the appropriate link above. (Please also be aware that we sometimes combine these professional groups in one workshop with “break-out” sessions.) We hope to have the pleasure of meeting you at a workshop soon! American Psychiatric Association. Diagnostic and Statistical Manual of Mental Disorders. (3rd ed.). (1980). Washington, D.C.: APA. American Psychiatric Association. Diagnostic and Statistical Manual of Mental Disorders DSM-IV-TR (4th ed.).(2000). Washington, D.C.: APA. Ayres, A.J. (1972). Sensory Integration and Learning Disorders. Los Angeles: Western Psychological Services. Brown, C., Tollefson, N., Dunn, W., Cromwell, R., & Filion, D. (2001). The Adult Sensory Profile: Measuring patterns of sensory processing. American Journal of Occupational Therapy, 55, 75–82. Bundy, A.C., Lane, S.J., and Murray, E.A. (2002). Sensory Integration- Theory and Practice, 2nd Edition. Philadelphia: F.A. Davis Company. Champagne, Tina. The Sensory Modulation Program for Adolescents & Adults (2008). From the Innovations-OT.com website. Excerpt from: Champagne, T (2008). Sensory Modulation & Environment: Essential Elements of Occupation (3rd Ed.) Southhampton, MA. Holzel B.K, Carmody J., Vangel M., Congleton, C., Yerramsetti S.M., Gard T., Lazar S.W. (2011). Mindfulness practice leads to increases in regional brain gray matter density. Psychiatry Research: Neuroimaging 191, 36-43. Hölzel, B.K., Ott, U., Gard, T., Hempel, H., Weygandt, M., Morgen, K., Vaitl, D., (2008). Investigation of mindfulness meditation practitioners with voxel-based morphometry. Social Cognitive and Affective Neuroscience 3, 55–61. Hölzel, B.K., Carmody, J., Evans, K.C., Hoge, E.A., Dusek, J.A., Morgan, L., Pitman, R.K., Lazar, S.W. (2009). Stress reduction correlates with structural changes in the amygdala. Social Cognitive and Affective Neuroscience 5 (1), 11–17. Hölzel, B.K., Ott, U., Hempel, H., Hackl, A., Wolf, K., Stark, R., Vaitl, D. (2007). Differential engagement of anterior cingulate and adjacent medial frontal cortex in adept meditators and non-meditators. Neuroscience Letters 421, 16–21. Hunt, S.C., Jakupcak, M., McFall, M., Orsborn, M., Felker, B., Larson, S., and Klevens, M. (2006). Re: chronic multisymptom illness complex in gulf war I veterans 10 years later. American Journal of Epidemiology, 164, 706–710. Kardiner, A. (1941). The Traumatic Neuroses of War. Psychosomatic Medicine Monographs, 1(2 & 3). Lane, S.J. Shaaf, R.C. (2010). Examining t nerscience evidence for sensory-driven neuroplasticity: Implications for sensory-based occupational therapy for children and adolescents. American Journal of Occupational Therapy, 54, 375-390. Lanius, RA, Bluhm, R, Lanius, U, Pain, C. (2006). A review of neuroimaging studies in PTSD: Heterogeneity of response to symptom provocation. Journal of Psychiatric Research, 40, 709-729. Lanius RA, Williamson PC, Densmore M, Boksman K, Gupta M, Neufield RW, Gati JS, Menon RS. (2001). Neural correlates of traumatic memories in posttraumatic stress disorder: a functional MRI investigation. American Journal of Psychiatry, 158, 1920-1922. Lazar, S.W., Kerr, C.E., Wasserman, R.H., Gray, J.R., Greve, D.N., Treadway, M.T., McGarvey, M., Quinn, B.T., Dusek, J.A., Benson, H., Rauch, S.L., Moore, C.I., Fischl, B. (2005). Meditation experience is associated with increased cortical thickness. Neuroreport 16, 1893–1897. Lazar, S.W., Bush, G., Gollub, R.L., Fricchione, G.L., Khalsa, G., Benson, H. (2000). Functional brain mapping of the relaxation response and meditation. Neuroreport 11, 1581–1585. May-Benson, T. (2009.) Occupational Therapy for Adults with Sensory Processing Disorder. OT Practice, June 15, p.15-19. Newport, DJ & Nemeroff, CB.(2003). Neurobiology of Posttraumatic Stress Disorder. FOCUS, 1(3). Rothschild, Babette. Post-traumatic Stress Disorder: Identification and Diagnosis. © 1997. Invited article for Soziale Arbeit Schweiz (The Swiss Journal of Social Work) February 1998. Retrieved May 25, 2009, from http://home.webuniverse.net/babette/PTSD.html. RAND Center for Military Health Policy Research. (2008). Invisible wounds: Mental health and cognitive care needs of America’s returning veterans. Retrieved May 22, 2009, from www.rand.org/pubs/monographs/MG720/. Scaer, R.C. (2005). The Trauma Spectrum: Hidden Wounds and Human Resiliency. New York: W.W. Norton & Company. Stoller, C. & Cimini, L. (2008). [Sensory Profiles of Older Veterans Diagnosed with PTSD.] Unpublished data. Stoller, C.C., Greuel, J.H., Cimini, L.S., Fowler, M.S., & Koomar, J.A. (2012). The effect of sensory enhanced yoga on symptoms of combat stress in deployed military personnel. American Journal of Occupational Therapy, Vol. 66, p. 59-68. Van der Kolk, B.A. (2000). Posttraumatic stress disorder and the nature of trauma. Dialogues in Clinical Neuroscience (2)1: 7-22. Van der Kolk, B.A. (2008, June 25). Affect Regulation. Lecture presented at a Pre-Conference Institute of the 19th Annual International Trauma Conference, Boston, MA. Van der Kolk, B.A. (2004). Psychobiology of posttraumatic stress disorder. In J. Panksepp (Ed. ), Biological Psychiatry. Hoboken, NJ: Wiley-Liss, Inc.